BBIP Board member, Ibu Vicki in Bukittinggi, Sumatra, 18 March 2019. Original article retrieved from Klikpositif on 29 March 2019. Klikpositif article translated by Joel and Moya in BBIP class, 2 April 2019. WA teacher of English and Indonesian, Vicki Richardson says that good relations btween the governments of Indonesia and Australia have led to many schools in the two countries working together. 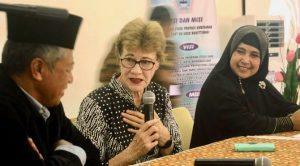 “There are as many as 150 schools in Indonesia and 150 Australian schools that have undertaken educational projects together and they have done student exchanges,” said Vicki when visiting STIKes Fort De Kock Bukittinggi, Monday 18 March 2019. She explained that the learning of Indonesian is compulsory in Australia and begins in kindergarten. The cooperation between the two countries, according to Vicki also opens opportunities for Indonesian workers to work in Australia. “Aged-care nurses are in high demand in Australia and this is an opportunity for Indonesians who want to work overseas,” continued Vicki. Currently, the initator of educational cooperation between Australia and Bukittinggi, Gusrizal, says that opportunities for Indonesians to work overseas, especially in Australia, are very high. “The Government has provided Indonesians under 35 years with opportunities to work in Australia. Besides the health sector,there are also opportunities in agriculture,” said Gusrizal. Currently, the Head of STIKes Fort de Kock Bukittinggi, Nurhayati, said that she hoped the visit of their special Australian guest would motivate their students to work overseas later, especially in Australia. “Bringing guests from overseas is one of our initiatives to prepare graduates to be competetive overseas. We hope students are motivated to want to work overseas, not just think about working in their villages or regions close to home,” said Nurhayat.